Spartan Choir - you have a voice. use it. Our annual Broadway Review ALL THAT JAZZ will take place next Friday and Saturday at 7:00 PM at West Springfield High School in the auditorium. 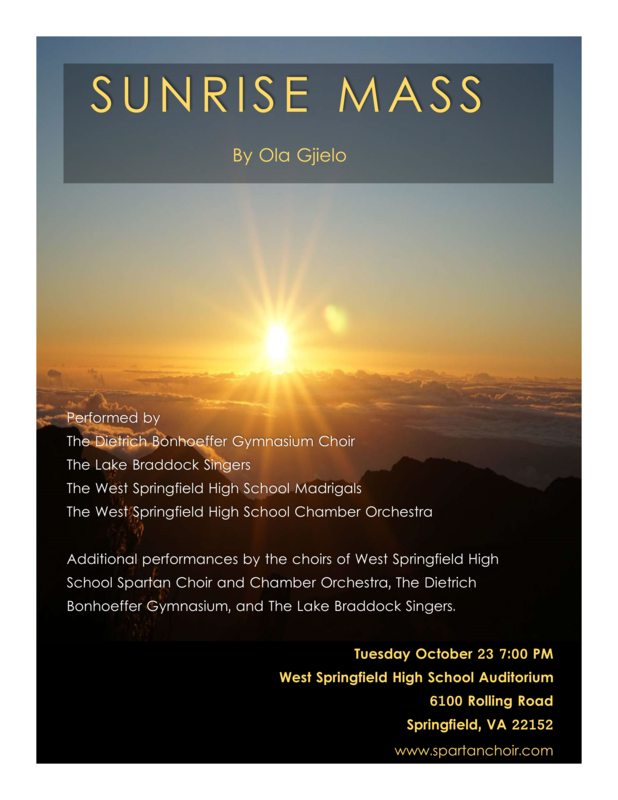 Tickets can be purchased in advance at www.spartanchoir.com/tickets or they can be purchased at the door. Last week students were asked to sign into google classroom to complete a choir survey, a Germany survey, print out their emergency care card, and the signature page of the choir handbook. Additionally, the visible learning for all choirs is posted in Google. If you would like to access the choir calendar or add our calendar to our smartphone or iCal app or view any other forms check out www.spartanchoir.com/calendar and www.spartanchoir.com/forms for more details. Some of you may have already had the discussion with your student about the fact that we will travel to Germany next summer as part of an exchange program with the DBG Choir of Eppelheim Germany. In order to make this exchange work we need host families to host a German student from October 13 to October 27th. Students who host will receive first priority on traveling to Germany. Below is the list of students that said they would like to host, and the number of students that they can host. We are currently 1 house shy of housing all 32 students. If you cannot host please contact me immediately. If you CAN host and would like to host please also contact me immediately. Some people have 2 or even 4 students. If we have too many hosts this is not a bad thing! If you are hosting and/or would like to go to Germany with us in June – please attend the General Booster Meeting Next Tuesday September 11th at 7:00 PM in the Choir room. Use Door 4 around the back to access the room.